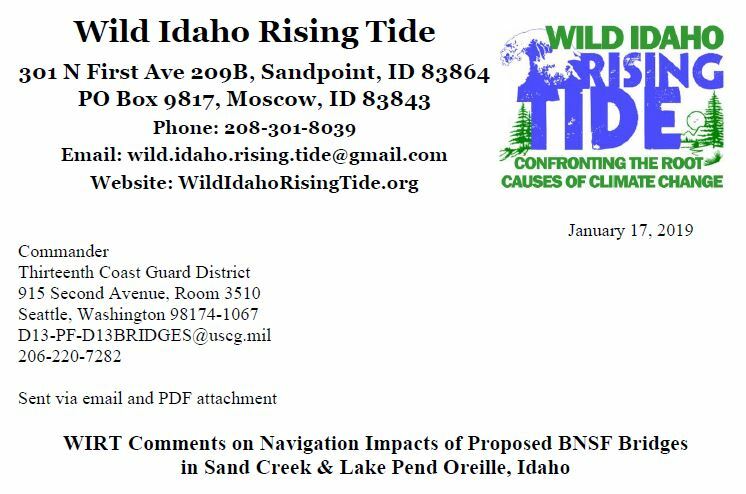 Wild Idaho Rising Tide (WIRT) is completing newsletters about eighth WIRT celebrations, dismissal of our state court case against doubled, north Idaho, railroad bridges, a re-opened, Coast Guard, comment period on that BNSF proposal, and other related topics, delayed by a recent week of long-overdue rest. 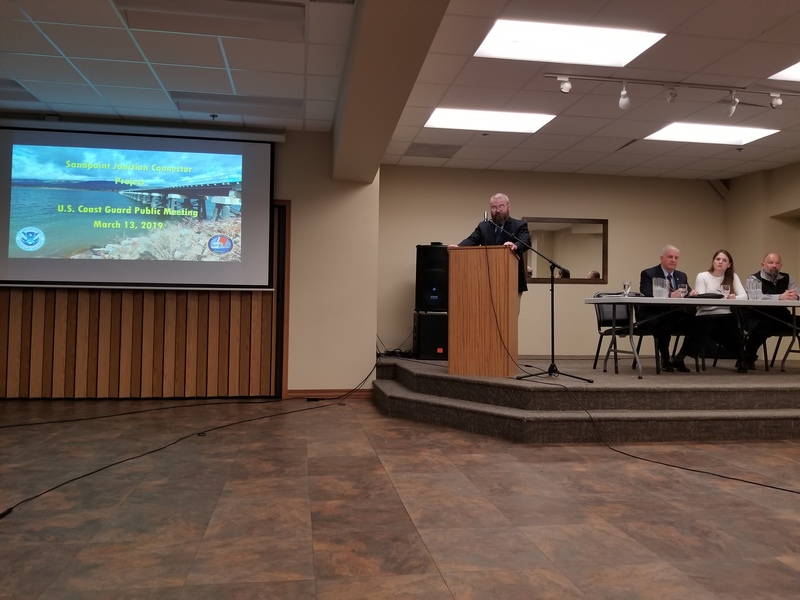 But we are sending this 2019, southwest Idaho, oil and gas information first, drawn from WIRT facebook posts and lodged on the WIRT website on April 17, in solidarity and support of a Tuesday evening, April 16, talk in Moscow. The Moscow Sustainable Environment Commission (SEC) will host a Skyped, slide presentation and talk by Shelley Brock of Citizens Allied for Integrity and Accountability (CAIA) at 7:15 pm on Tuesday, April 16, at the Water Operations Building, 201 North Main Street in Moscow, Idaho . Shelley will discuss oil and gas well issues in Idaho, including landowner and CAIA, legal challenges of state forced pooling/integration processes, by which the Idaho Oil and Gas Conservation Commission and Department of Lands force property owners to lease their mineral resources and rights to oil and gas companies. Please attend this insightful event and/or contact SEC at sec@ci.moscow.id.us or 208-883-7133, for further information. “U.S. District Judge B. Lynn Winmill had ruled in August that the Idaho Department of Lands’ procedure for forcing mineral rights from unconsenting owners into pools for extraction violated due process. After Winmill reaffirmed the ruling on February 1, the state faced a deadline early in March to formally appeal…CAIA, an Eagle-based group which had joined in the suit challenging the forced pooling methods, noted…that the state had opted not to contest Winmill’s ruling…Idaho Department of Lands hasn’t announced next steps to address the due process shortcoming . …Unlike the CAIA-led suit against Idaho gas and oil regulators, the class action complaint filed March 1 in Payette County was brought by [nine local] lessors who signed [six] agreements to lease their mineral rights. The complaint seeks to end [gas producer] Alta Mesa’s alleged practice of deducting a portion of the producer’s midstream expenses from the lessors’ royalty checks [that the oil and gas leases do not expressly authorize]. It also points to a requirement under the Idaho Oil and Gas Conservation Act that interest of 12 percent be added to royalty payments not paid within 60 days of their due date…The action is brought on behalf of the class of all ‘persons who are or were royalty owners in Idaho wells where defendants [various Alta Mesa entities and others] are or were the operator…from January 1, 2014 to the date class notice is given…The class claims relate to royalty payments for gas and its constituents (such as residue gas, natural gas liquids, or drip condensate)’” . Despite a Tuesday, April 9, deadline for comments, please write an email to Kourtney Romine (kromine@idl.idaho.gov) at the Idaho Department of Lands (IDL) and blind-copy your input to CAIA (sb-caia@hotmail.com), objecting to the state practice of forced lease pooling that allows oil and gas drilling operations against property and mineral owners’ wishes, and providing suggestions for better processes to protect vulnerable communities from similar, future activities, as prompted by the linked, CAIA, talking points and ideally regulated by proposed rulemaking . If possible, also attend and/or watch the Idaho Oil and Gas Conservation Commission (IOGCC) hearing at 1 pm on Tuesday, April 23, to pack room EW 42 of the state capitol and/or testify for three minutes about “just and reasonable” terms for future, forced pooling applications that impose inadequate compensation and profound risks on Idaho citizens. Thanks to Shelley Brock of CAIA for her action alert! Thanks to the dozens of Missoula, Moscow, Sandpoint, and Spokane activists who participated in the slide shows and lively discussions about Burlington Northern Santa Fe (BNSF) Railway’s proposed, Lake Pend Oreille, Sand Creek, and Sandpoint area, bridge and track expansion, associated, public input and agency decision processes, the Wild Idaho Rising Tide (WIRT) petition for judicial review of a state encroachment permit for the project, and effective, comment and testimony tactics for opposing the current, U.S. Coast Guard, draft environmental assessment (EA), issued instead of a more scientifically rigorous, draft environmental impact statement (EIS) on February 6. WIRT activists are grateful to meet, see again, and talk and stay with the dedicated, regional community members so essential to the continent-wide, grassroots movement of water and climate protectors resisting fossil fuel infrastructure! Thanks for your hospitality and ongoing work! Since early February, WIRT activists have engaged regional activists, friends, and supporters via 2000-plus email alerts, over 500 facebook posts, 750 miles of visits, and hundreds of event announcement media releases, flyers, and handouts, to instigate public participation in four #No2ndBridge talks and draft EA comment and testimony opportunities. We also rescheduled our Spokane presentation to attend the March 7, Lake Pend Oreille Waterkeeper (LPOW)-Idaho Conservation League (ICL) meeting about the draft EA, to ascertain and assert #No2ndBridge intentions for court challenges of a final EA and an unimaginable finding of no significant impact (FONSI). An updated outline and eventual description of the #No2ndBridge, state court case, with links to pertinent documents, drawn from the electronic, online, Idaho judicial records system, iCourt: Select “Smart Search,” enter “Wild Idaho Rising Tide” and the captcha code, and click “Submit,” then the case number CV09-18-1084. July 20, 2018: WIRT filed a Notice of Appeal of Final Order of Approval of Encroachment Permit L-96-S-0096E to Applicant BNSF, as a new appeal or petition for judicial review (civil case type L3), with filing fees and a posted, cash bond of $500, in Idaho first district court in Sandpoint, Bonner County, initiating active and pending case number CV09-18-1084. July 25, 2018: First district judge Barbara Buchanan issued a notice of proposed case dismissal and an order striking the WIRT notice of appeal. August 7, 2018: WIRT filed a request for a filing extension for an amended notice of appeal and petition for judicial review of the final order of approval of encroachment permit L-96-S-0096E to applicant BNSF. August 15, 2018: First district judge Barbara Buchanan issued an order granting the WIRT request for a filing extension. August 20, 2018: Retained, case lead attorney Angela Schaer Kaufmann and retained attorney Joy Vega, both of the Idaho attorney general office, filed their notice of appearance for state respondents. On Friday, February 8, news spread of the U.S. Coast Guard release of a draft environmental assessment (EA), not a more scientifically-rigorous, community-preferred, Sandpoint City Council-requested, draft environmental impact statement (EIS) with route and design alternatives, on Burlington Northern Santa Fe (BNSF) Railway’s proposed construction of second (in order to replace the first) railroad bridges across Sand Creek and almost one mile over Lake Pend Oreille, in Sandpoint and Bonner County, Idaho [1-3]. On the same day, district judge John Judge heard oral arguments by phone, on BNSF and state of Idaho motions to dismiss Wild Idaho Rising Tide’s (WIRT) seven-month, #No2ndBridge lawsuit, on standing, jurisdictional, and procedural issues, not the strong, meritorious arguments of our petition for judicial review of an Idaho Department of Lands (IDL)/Idaho State Board of Land Commissioners encroachment permit for BNSF’s bridge expansion . 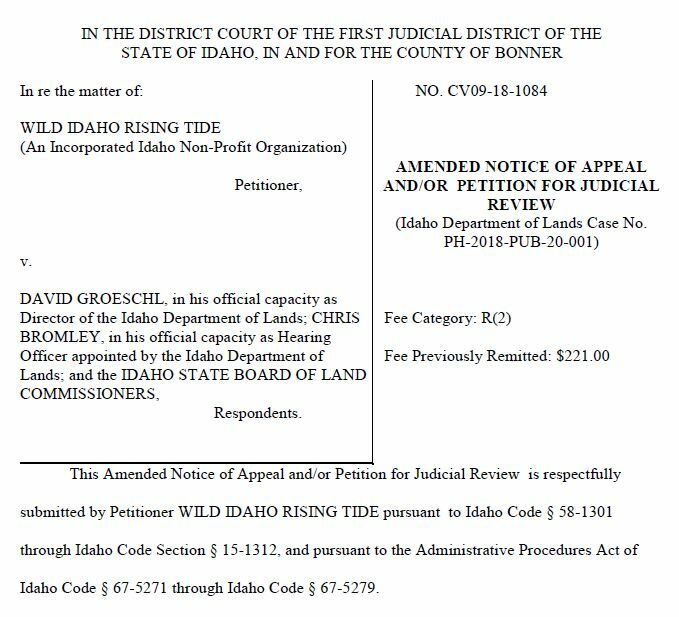 The judge did not immediately rule on these complex, dispositive and other motions, responses, replies, and objections, but has been deliberating and writing his difficult, landmark decision on Lake Protection Act and Idaho standing laws, during recent and coming weeks. As activists cautiously participating in public processes, we remain hopeful, and acquired greater respect for judge John Judge at the hearing attended by two WIRT board members. Like the north Idaho community, WIRT activists have since been devastated by intense, sub-zero, northeast winds gusting to 50 mph and spewing railroaded coal into the lake and neighborhood tree falls during the February 8-10 weekend, deep, engulfing snows throughout the following week, and a nearby, downtown Sandpoint fire on Monday morning, February 11 . Despite firefighters from several regional districts working amid snowfall, 11-degree temperatures, and aerial hose spray that coated them with ice, the fire inflicted smoke and water damages on a church and destroyed and displaced six local, small businesses (three restaurants, a pub, a salon, and a tattoo/piercing shop) in a couple of century-old buildings, at the corner of Bridge Street and First Avenue in Sandpoint’s historic district. 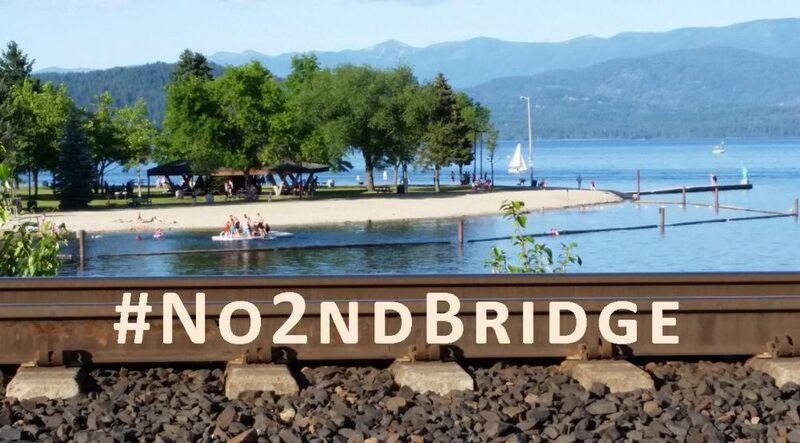 These Sandpoint City Beach area businesses and surrounding residences most directly, significantly impacted by BNSF’s corporate, infrastructure expansion scheme continue to suffer fire losses and/or travel restrictions since the incident at the site of one of WIRT’s most recent direct actions during the Fourth Panhandle Paddle, when Occupy Spokane and WIRT activists spotlighted #No2ndBridge, anti-fossil fuels, and other environmental, climate, and social justice messages outside China Kitchen on September 8, 2018 . Sandpoint police and Idaho fire marshals are investigating the cause and origin location of the fire, and a city-hired engineer condemned both stability-compromised structures, due to fire damages estimated at $4 to $7 million. The Sandpoint, fossil fuels frontline also lost an indigenous art store and Italian restaurant to city building condemnation last September. Frustrated with lawsuit financial and communication oppression and limited community responses to ongoing, WIRT pleas for support of litigation expenses, we are sending this recently rare, action alert to our thousand regional contacts, about these and other situations requiring public input, drawn from WIRT’s primary modes of outreach communication, our weekly, Climate Justice Forum radio program and numerous facebook posts over the last few months. 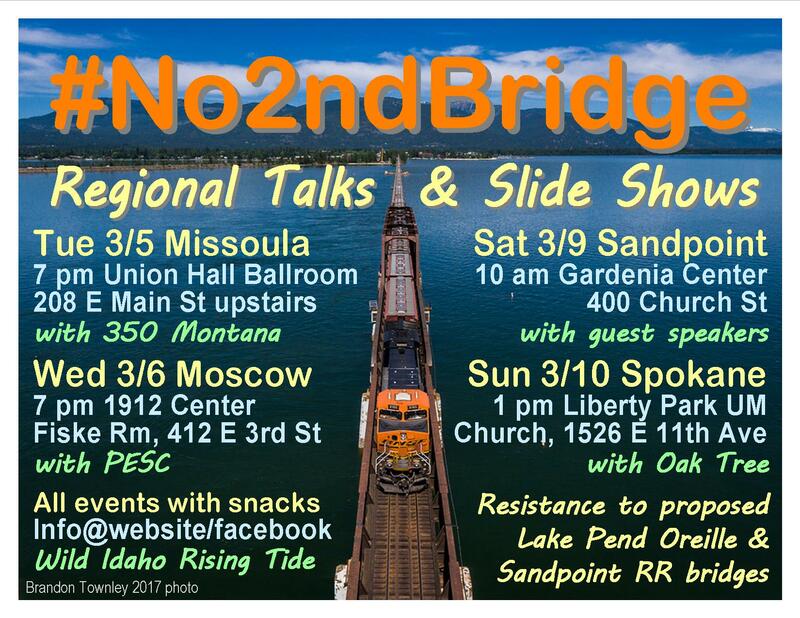 In forthcoming newsletters, we plan to further provide court case updates and requests for your contributions toward our legal battles, and to announce #No2ndBridge presentations on March 5, 6, 8, and 9, respectively in Missoula, Moscow, Sandpoint, and Spokane. 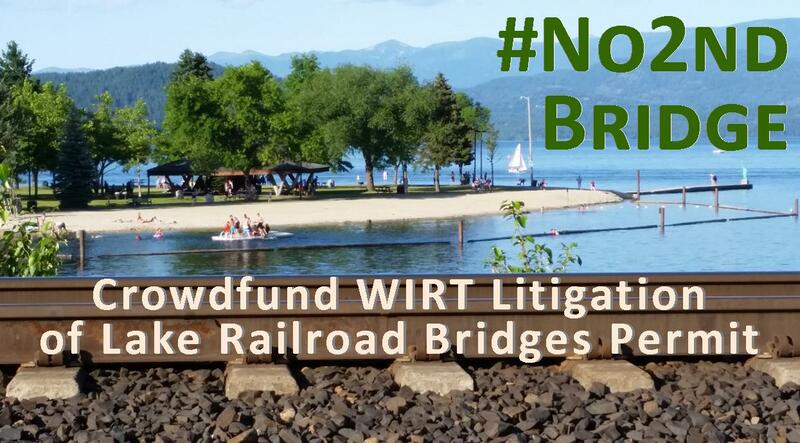 On Tuesday, October 23, registered, Idaho, non-profit Wild Idaho Rising Tide (WIRT) launched the live, 90-day, crowdfunding campaign No Second Railroad Bridge over Idaho’s Largest Lake! on CrowdJustice . 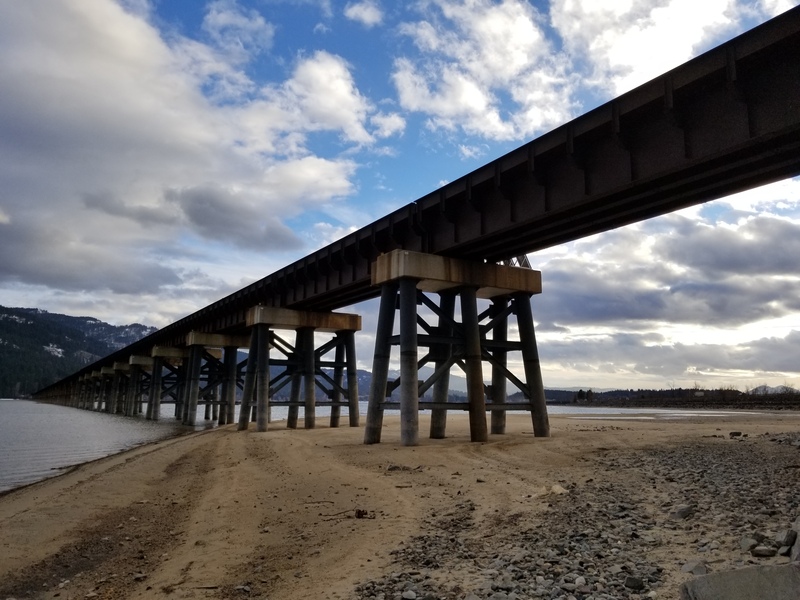 We urgently need your help raising funds and organizing support for our petition for judicial review of the June 21, 2018, Idaho Department of Lands (IDL) permit for Burlington Northern Santa Fe Railway’s (BNSF) proposed construction and operation of two permanent and two temporary, parallel, railroad bridges adjacent to the present rail route across Sand Creek and almost a mile over Lake Pend Oreille, near Sandpoint. 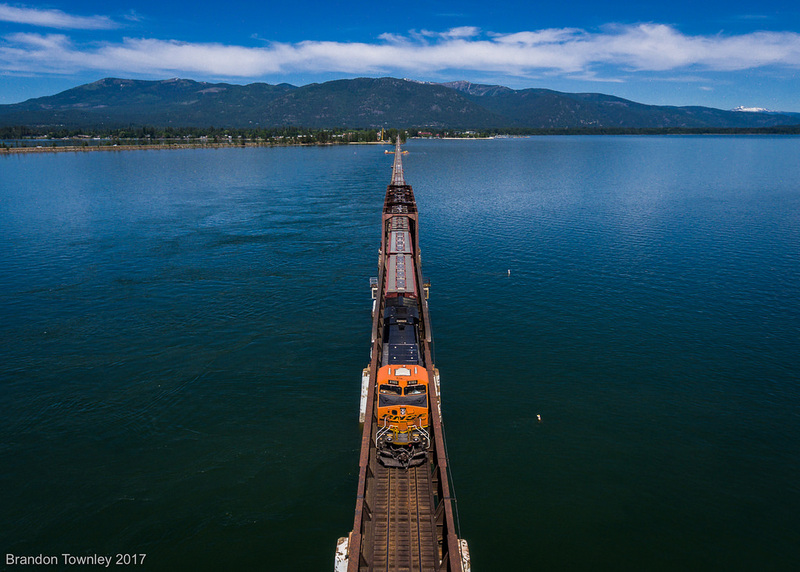 Numerous citizens, groups, and government officials have offered written comments, hearing testimonies, public protests, and media articles during the last few years, expressing our concerns over BNSF’s Sandpoint Junction Connector project. Dismissing this broad input, the state of Idaho approved BNSF’s encroachment permit. So we are requesting that the Idaho First District Court in Bonner County conduct a rigorous, judicial review of the IDL record, and remand this agency decision for further IDL consideration. And we are asking for your financial and outreach assistance of grassroots, volunteer, WIRT activists directly engaged in this legal effort. WIRT greatly appreciates your physical and fiscal support of our extensive, fossil fuels resistance work over the last eight years. Your essential participation has contributed to a continent-wide movement that is confronting the root causes of climate change, water degradation, and air pollution, through frontline resistance and solidarity and community solutions. Among our many successful campaigns, WIRT has never faced such enormous, current, and upcoming expenses needed to access the courts and proceed with this case, including attorney, administrative record, bond, filing, and printing fees.